Late in my Senior year of high school, our social studies teacher devoted a class to distributing voter registration forms. The next election wouldn’t be until after we graduated, but Sr Raimonde was determined that every graduate of our school was going to be a registered voter. We were a bright class, but somewhat naive. We knew a good deal more about history (thanks in part to Sr Raimonde) than we did about current events and contemporary politics. The voter registration form wasn’t difficult to complete, until it asked what political party we wished to register with. Sr Raimonde wisely advised her that she was free to register with whichever party she wanted. The girl pondered this for a moment, then announced that because her both her parents were Democrats she would register as a Democrat. Another girl said her parents were Republicans so she would register as a Republican. One, slightly rebellious, decided to register with the party her parents did not belong to. This helped me not at all. One parent was a Democrat, the other a Republican. Although I was in a Catholic school, only my Mother was Catholic; my Father is Presbyterian. Dad was born in Brooklyn and until he was about four years old he spoke Swedish, as his immigrant parents usually did at home. Mom was born in Montreal while her parents were visiting relatives, and until she was almost three years old spoke mostly French. Then her family moved back to New York City–to the Bronx! Really, when I think about it, it’s a wonder they ever met, let alone married. Although our Catholic school was looked upon by students at local public schools (and even a few of the other parochial schools) as a bunch of nerdy goody-two-shoes, it was something of a tradition that each class had one out-spoken radical. Our radical was Michelle, and now she raised her hand to ask Sr Raimonde, “Do we have to register with a party?” No, Sr Raimonde said, we could register to vote without specifying a party, but if we did we wouldn’t be able to vote in primaries, only in general elections. I’m not sure if anyone else went that route, but I did and I’m pretty sure Michelle did. At the time I expected that some day, when I’d learned a bit more about politics, I’d make a decision. But as I learned more about politics, I discovered that I wasn’t entirely fond of either party. I’ve occasionally voted for third-party candidates, but I’m not any more happy with those parties in general. Many years later, I remain unaffiliated and my personal political pendulum has swung slightly left or right of center, but never far from the middle. I’ve missed only about three elections in my entire life, but I’ve never voted in a primary. In the past few years, what passes for political discourse in the United States has become increasingly polarized, sometimes downright nasty, and I find myself feeling somewhat lonely near the middle. We centrists aren’t very good at ranting, so we don’t get heard above the noise. 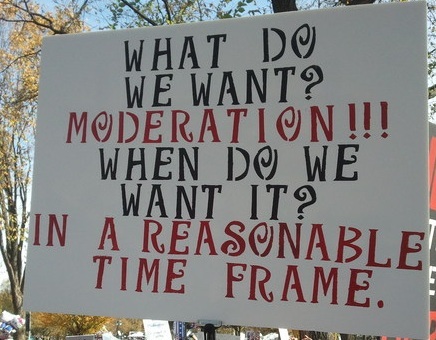 You’ll understand why I loved this poster from Saturday’s Rally to Restore Sanity in Washington, DC (a place that could use a bit of sanity these days). I don’t know who made it (please leave a comment if it was you!) but the photo was posted by the blogger at LetTeddyWin.com–a die-hard Washington Nationals fan. One imagines he’s voted for a few underdogs in his time. Lately I’ve begun to think we all need a Sr Raimonde in our lives. Someone who won’t tell you what party to register with or who to vote for, but who will simply tell you that if you are eligible to vote, you should register. And if you are registered, you should vote. Let’s not leave the decision-making to the extremes on both sides. If you’re reading this blog, I want to be your Sr Raimonde. The message is simple: VOTE.